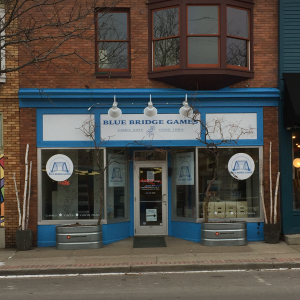 Blue Bridge Games is your friendly, local game store in the Uptown neighborhood of Grand Rapids. We are a welcoming community for players and spread the joy of board gaming to everyone. Stop by and pull up a chair, turn off your phone, and reconnect with others around a great board game! With over 110 games in our store game library, there is something fun for everyone! A game library play pass is good for the whole day (just $5 per person) and lets you try as many titles as you’d like! Our staff is happy to make recommendations that will be fun for you and your group. Become a Blue Bridge Games Member! Benefits include unlimited use of the play space and stellar game library (overnight rentals too! ), discounts on special orders, and more. Check out the Membership tab for more benefits and join in-store. Blue Bridge Games on East Fulton offers a great selection of board and card games, puzzles and more! Check out the Shop tab for more details about what you can find in-store and learn about our online Magic: The Gathering singles selection.